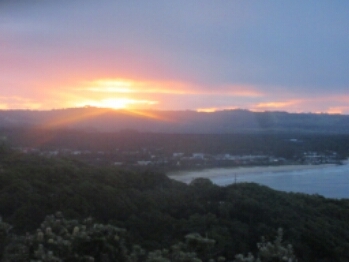 Byron Bay – Where's Walton? 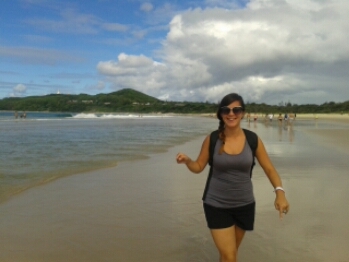 Well hello there Byron Bay! 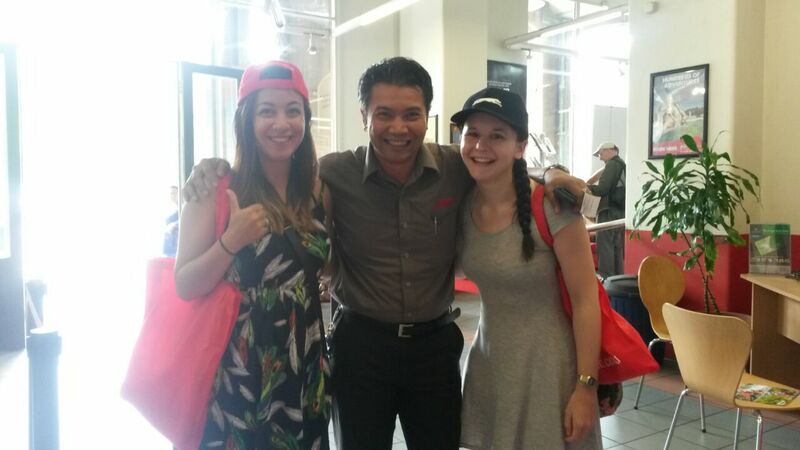 To travel up the East Coast we booked a Greyhound Hop on Hop Off ticket to take us all the way up to Cairns. This cost $419 but is unlimited bus trips for 3 months to take us from Sydney all the way up to Cairns. Considering the bus to Byron Bay from Sydney was $95 (only a small distance in comparison to the rest of the coast) this was an offer we couldn’t refuse and it also meant we didn’t have to worry about extra travel costs. However we only have 2 weeks to see as much as possible! 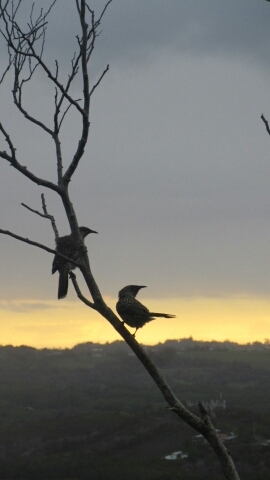 No more lazyness, we are back on traveller mode and back on a traveller diet – no more timtams! We had amazing customer service from Mank at Greyhound! 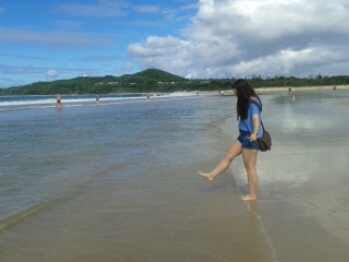 Byron Bay was a really nice and relaxing place, suprisingly! For a place famously known as a place for stoners and surfers it was very family friendly and a sweet little town. We arrived at 7am and understandably our room wasn’t ready until 1pm. So we decided to get some breakfast and seize the day. This is where our travelling changed for the better… At a local café a poached egg on toast with a coffee was looking to cost $20… we decided in that moment we are NOT eating out again for the rest of Australia (if we can help it) and instead tottled over to Aldi, our new favourite place, we managed to get 3 days worth of food (breakfast, lunch and dinner) for $10 each. 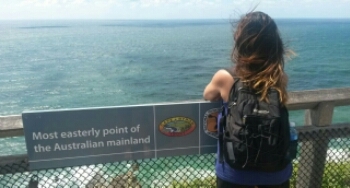 This may be boring information, but I know so many people who’ve ended up cutting travels short because of how much they spend in Australia – this was not going to be us!! 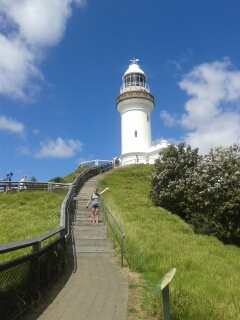 After sorting food we trekked around Byron Bay and 2.5km uphill to the lighthouse. 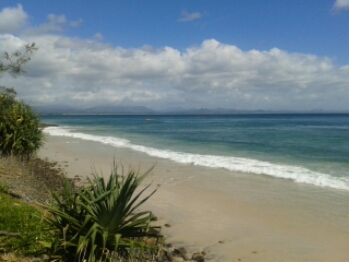 The coastal walk was beautiful overlooking the sea, beaches, surfers and sunshine! 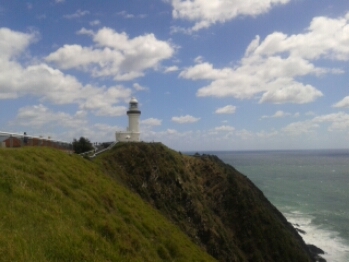 Apparently during May to Oct on this walk you can see whales migrating (gutted it’s February). I’m just going to put this bit of information out there that if I see a whale on my trip naturally in the ocean, it will make/complete my life!!!!! 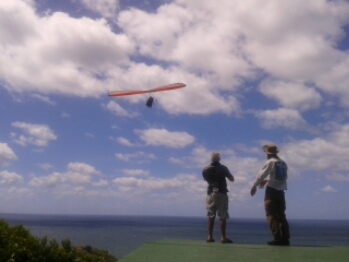 That’s the top of the wish list! But I doubt it will happen in Aus, maybe New Zealand *fingers crossed*. 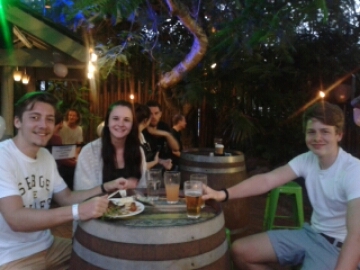 Later that evening we were pleased to find that we got a free drink for staying at our hostel and a free bbq with the purchase of a drink. For $3 beverages this was a bargain we couldn’t refuse! We sat ourselves down next to some youngsters and we had a great evening of live music. 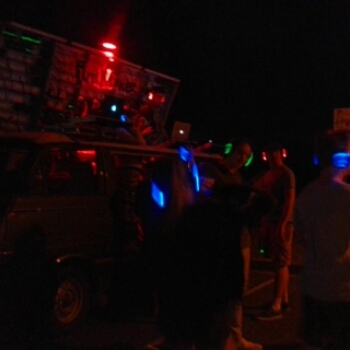 After this we had a look around the bars and even found a silent disco on the beach where the DJ decks was a van. The next day the weather was a bit too chilly for a beach day so we had an admin morning and booked the rest of Australia – the route, the buses, the tours, the hostels. Done! 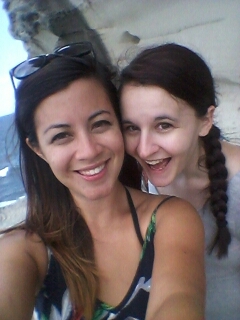 Then had a romantic walk on the beach with Bekki. After this, after looking in a few shops there isn’t much else to do but it is a nice place to relax in. That evening we did the lighthouse trek again but this time walked through the forest in order to see the sunset view. Now if you read my blogs you’ll know me and sunrises/sunsets tend to never work – and this is no exception. It was cloudy as usual but still worth the walk. A lucky shot just at the end! 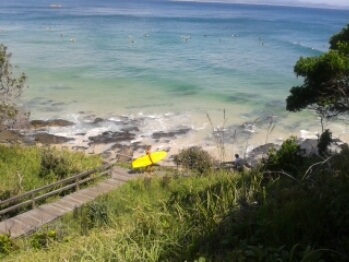 Now that I’ve left Byron Bay I’m starting to see why young gap year brits flock to Australia to travel… It’s like going to University and checking into halls, so similarly there’s a meet and greet person to take you to the hostel as you hop off the bus, a communal kitchen, Xboxs, pool tables, cheap bar etc. 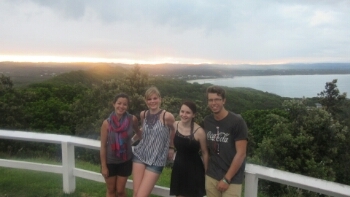 The average age of backpackers I met here was 18-20 in comparison to Asia which was 22-25 years old. I am happy to report that two different groups thought Bekki and I were 19 (I graciously accepted that compliment)! 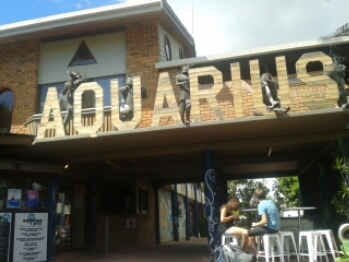 We also loved Aquarius hostel especially as the reviews were so mixed – I found it to be very well thought out for backpackers and if you’re new to travelling they pretty much sort out everything you need. In addition to this, during your stay you pay a deposit to get a box of crockery. This way backpackers don’t leave their unwashed dishes in the sink (you have no idea how annoying that is). 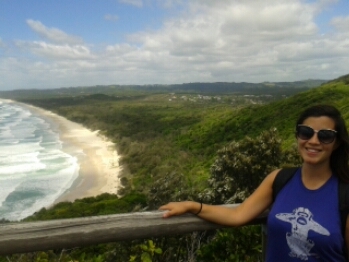 I’d highly recommend this place to all backpackers travelling through Byron. 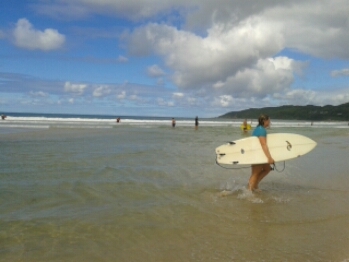 Next location…Noosa followed by Rainbow Beach and Fraser Island. ← See you soon Sydney! !